Everyone loves the beautifully colored leaves of a New England autumn. The challenge is using them in centerpieces without losing their brilliant color. I didn't save any for waxing last year (hope to this year) but I wanted some brightly colored foliage for my centerpiece. I started thinking. 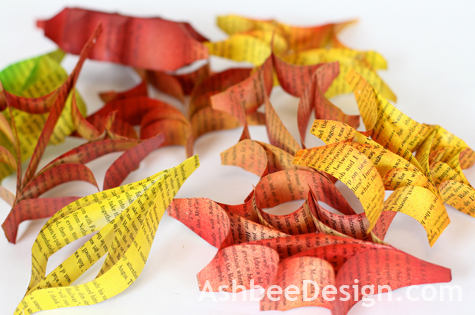 What I developed is a technique combining old book pages, some cutting and pasting, and spray paint to make paper leaves to use. They are unique, contemporary, and will hold their color through out the season! 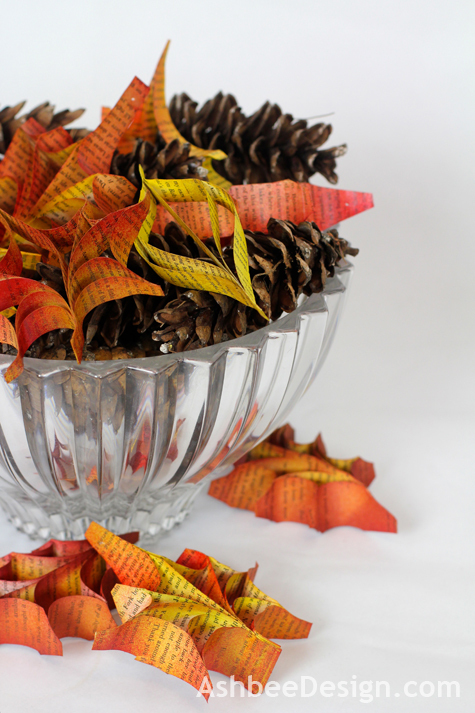 Here I have combined the leaves with pine cones in a coconut tree leaf bowl. 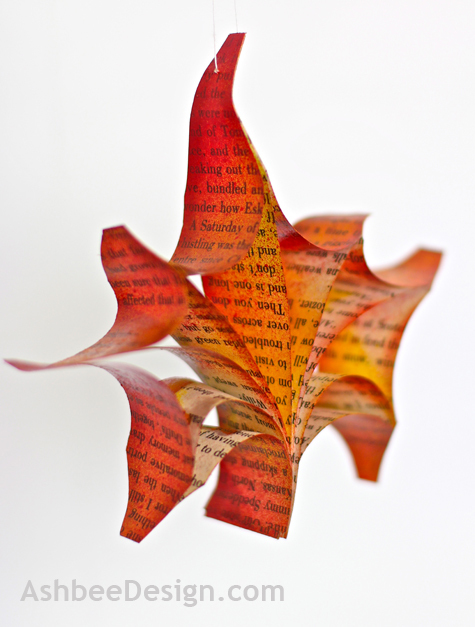 Each leaf is made by gluing strips of book page paper together based on the structure of specific leaves - maple above. I designed simplified versions of birch, oak and maples leaves all of which play significant roles in creating the fall landscape around here. The lettered pages add to the weathered appearance of the leaves. I made a pile of them applying the spray paint in different ways to create the colorful display. 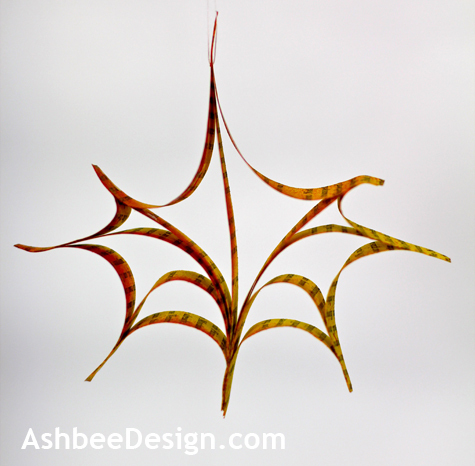 Each design is based on a linear skeletal structure which creates an dynamic pattern when viewed straight on. Click here for the step-by-step instructions on oak leaves. Click here for the step-by-step instructions of maples leaves. 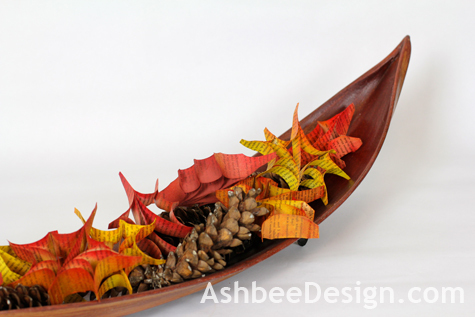 Click here for the step-by-step instructions on birch leaves. This is absolutely gorgeous. Love the colors and shapes. whoa. whoa now. those are something special. Thanks all for taking the time to comment. You know how it is...we put our ideas up here and wait for a reaction. Comments mean a lot. I'll be posting the how to on Maple leaves soon, to be followed by a project with "natural" leaves. It has been an inspiring project. Oh my gosh these are so beautiful! They are like snowflakes but for fall! Stopping by from Someday Crafts. 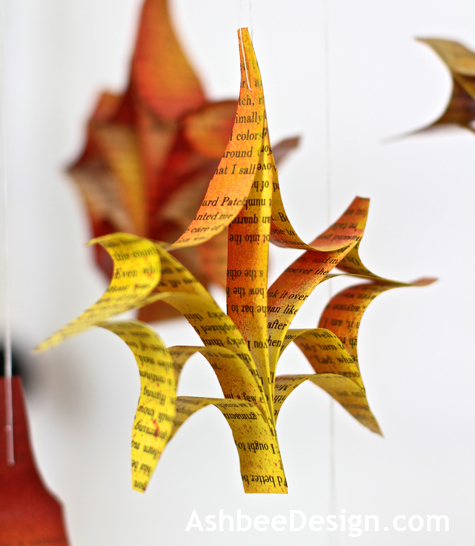 Beautiful a new meaning to book leaves.. I missed that in the name! Made me smile. Thanks, Merry! Thanks Michelle. I always try to hit your link party. I'll stop by and comment. So pretty! I saw you featured at Someday Crafts. Good place to find me! Thanks for commenting. 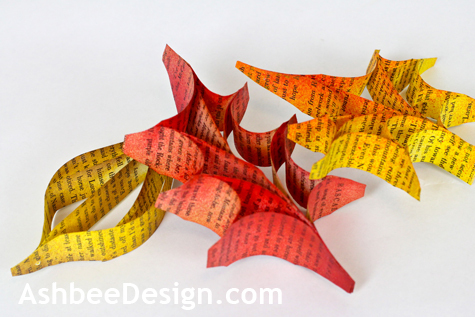 Fantastic take on book page leaves!! These are just gorgeous. What a cute idea! I love the book pages and the colors are so pretty! This is such a clever idea, and they look so pretty! Thanks for sharing the tutes so we can make our own too. I'm pinning this one for sure! These are adorable! I always appreciate the inspiration you share at Potpourri Friday! Should be there again this week with another book page project. Oh those are so lovely! What fun! Again.... you always amaze me! Very pretty and unusual. Will have to add that to my ever increasing to-do list. Wow - this is truly gorgeous!! I will be featuring this post on Tuesday!! Thanks for linking up at Take it on Tuesday! I look forward to what you come up with next!